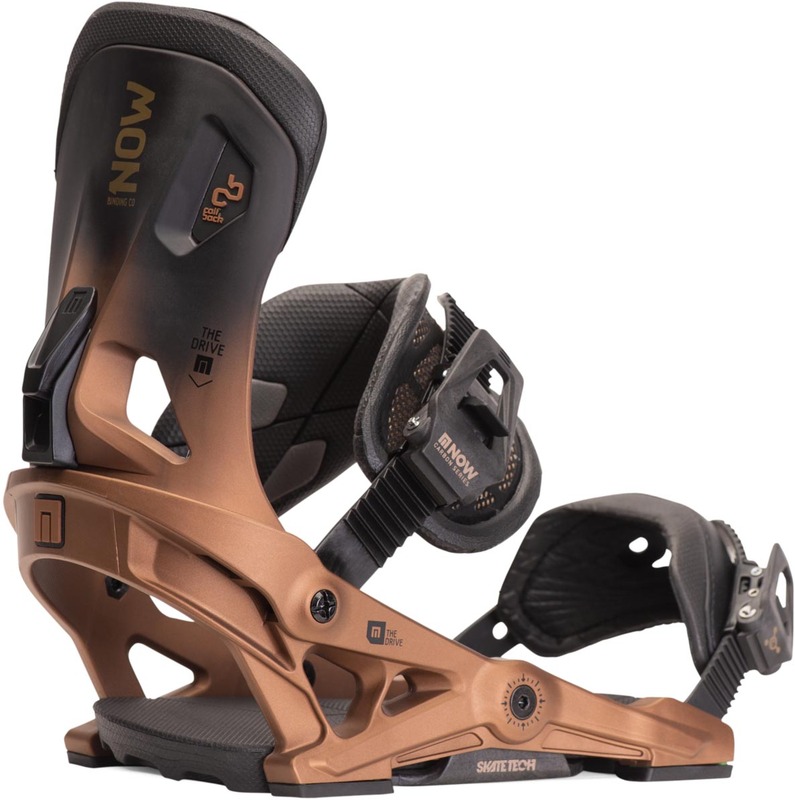 The NOW Drive is a binding that has some adjustability issues and some pressure points if the sole of your boots is softer but this dampens up the board and has super cush shock absorption. Also having the ability to change out the stoppers on the bottom is fun to do. We got to compare this to the Jones Mercury and Union Atlas and ride it on several different boards. Highback Flex: Pretty stiff but just enough give to be ok. Binding Adjustability: Not much going on here. High backs are pre-rotated, toe ramp isn’t adjustable and there is no real way to center the boot in the binding. It’s very plug n play. Wish they could change this and at least add an adjustable gas pedal. The ankle and toe straps adjust to most boots sizes in the range though. Stance Width Adjustability: Pretty good here and the Now Drive should accommodate most stance widths if you can turn the disc sideways but you might not be able to if the boot doesn’t center well in the binding. Comfort: I had one weird pressure point just before the gas pedal and I had to be pretty weary of tightening up my toe strap. I never crank down my ankle strap too hard but sometimes do with the toe strap. The support under the EVA foam puts pressure on the arch of my foot and tires me out a bit. If I ride with boots that have a thicker sole (unlike the Tactical ADV or in the past the Burton AMB’s) the issue disappears. So if you have a softer flexy sole then you might experience the same issues. Boot Support: Nice supportive ankle straps and toe straps to feel pretty locked in but the extra locked in feel comes from the heel loop working pretty snug with my Adidas Tactical ADV’s. It really feels like your boot is surrounded on all sizes. Turn Initiation: Pretty smooth edge to edge but not slow. The Now Drive doesn’t have that sharp turn initiation that Union can have where it jumps like an all wheel drive car off the line. Instead, this is about the same speed through the whole turn. One isn’t better than the other but instead, it’s all about what you prefer. Buttering: Going with softer stoppers helps but the strength of the kingpin tech isn’t really about buttering but instead just making the ride damper and giving a smooth but somewhat powerful response edge to edge. Ratchet System: Pretty smooth and good in a way that you just don’t notice them. Shock Absorption: Some of the best in the business. If you want cush shock absorption then this is for sure a standout compared to the rest of the industry. The NOW Drive really changed up the ride for 2017 by widening out the footbed. It’s still not without issues as discussed in the review below but the widened out footbed really makes it much more recommendable. It was great when paired up with a boot that has a rubber sole. If you have a boot with only softer EVA foam the Drive might have some pressure points on the bottom of your foot. 2015 Updates– Same general ride but the Highback is a little taller giving it a little more leverage. Flex: The high back has a middle ground torsional flex and about the same pulling it straight back. Adjustability: It’s pretty easy to adjust and dial out for your boot but there isn’t anything you can do for the high back rotation. It’s set to 10 degrees which are better than zero but I’d like to see them work out a way to rotate the high backs. The rest of the binding is toolless and fine. Comfort: The NOW drive is a mixed bag when it comes to comfort. The ankle and toe strap is very comfortable. The high back molds around the heel well but some could have a problem with the narrow feel of the heel cup. The heel cup offers a pretty tight fit that was even snug with our reduced footprint boots. It’s made this tight to ride without the high back so it’s got to grip well but it can feel a little crampy. We’d love to see them bevel out the heel loop a little further. So what some people might like about this boot, even if you don’t No Back, is it really squeezes around the ankle/heel area making your boots feel like they are really holding your heel down. This is kind of unique to what most bindings do. Sure the ankle strap grips around the front of your boot but we haven’t found another binding other than NOW that grabs on the back too. Turn Initiation: When we first demoed these bindings with the medium stoppers It kind of went 2 ways. Some felt that there was a delay transferring from edge to edge on groomers and others, including myself, felt like it was just smooth and middle ground when it came to response where you would think it would be very responsive with the kingpin tech. However, on the 2015 demo, we got a little extra time away from the demo booths to spend a couple of days of riding with all the different stoppers. This really changed my perspective and Jimbo’s as well. The stiffest stoppers on the bottom improved the response and I liked how it turned the board. There was much more snap edge to edge. Then every step softer makes the board turn a little slower. You can also flip the ankle strap to give you more freedom one way and more support the other which is fun. We stuck with the more responsive side in place to really test out how the different stoppers would do in the best case scenario. Buttering: There is some reduced contact with the board and the dead spot is limited but the binding doesn’t feel that free when it comes to buttering aboard. The tight grip around the heel cup feels like it’s inhibiting the ability to butter the board or flex it in other ways lengthwise. It feels much better edge to edge. That being said the softest rubbery/urethane stoppers on each corner lift the binding up above the board and create some flex making it feel better. With the stiffer stoppers, it’s not quite as easy/good. Boot Support: Your boot is locked in thanks to the supportive heel cup and for those that like an incredibly supportive feel despite the smaller ankle strap might like this binding a lot. The toe strap isn’t bad but we have had bigger more supportive over the toe straps. Ratchet System: Nice smooth easy ratchets and we had no issues. Shock Absorption: The NOW Drive offers up a really cushy ride that can help any board absorb more shock. It’s got a thickly padded footbed and the rubber/urethane stoppers between the base and the board. That makes for an incredibly damp and shock absorbent ride. These are a great compliment to any board that is going to see high speeds and uneven terrain. It makes any board you ride a better chunder buster. So all in all the NOW Drive is very unique and well-made binding. Some might absolutely love this and others might not. Peter, Stephen, and Eli weren’t into this binding while Mary, Lee, Jimbo and myself felt this was a fun ride. My only personal gripe is how tight the heel cup is around my ankle. Other than that I really enjoy this binding. 2015 NOW Drive with the softer stoppers under foot. 2015 NOW Drive Follow Up Review with the stiffer stoppers under foot. We try to get as many images of the NOW Drive, but forgive us if they're not all there. I've now got 2 pairs of these; the old 2014 model and the 2018. The revisions over the years really make a difference and, while I love the 2014's, the 2018's are a definite improvement. I was initially sold on the 'kingpin' 'feels like a skate truck' gimmick and so got some of these bindings after reading the rave reviews that came out at the time (clearly not here on The Good Ride!) The binding has always felt solid and just an extension of me. As far as I'm concerned, the best type of binding is the type that, once you're riding, you just don't think about. They have a moderately stiff highback, I've always kept the standard mid (I think) duro corner pads and have ridden in all conditions. The bindings are strapped to my Jones Hovercraft and I've used it carving on groomers and floating through several feet of fresh powder and the combo has excelled everywhere. The 4 year old ratchets are now getting a little floppy, but have lasted really well. Last year the bindings probably had 60-70 days on them and I've just replaced the ratchet straps as they were getting very worn. I've only just got these, but demo'd them for approximately 20 days last year (I worked in rentals). The toe strap has been much improved, and feels very solid and unmovable over the front of your boot. 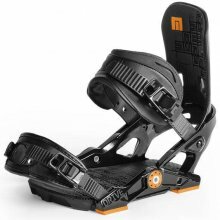 The newer bindings are lighter than the older ones, the toe and heel straps improved and more conforming, but still the same great feel on the snow. These bindings work well for short, quick turns, mid turns and long, hard carves. The rubber feet fall out easily when you're transporting them - I have already lost one. This obviously applies across the whole NOW range though. The 2014 heel straps are made of leather and starting to fall apart, but still function fine, so I'll just replace them when they get too bad. The 2018 model is rubber and should be more durable. Adjusting the toe and heel straps to your boots can be a bit finicky. Lastly, my 2014's are a Large and my 2018's are a Medium and my US10 (27.5) Salomon boots fit in both, but are the max size for the Med, and min for the Large. I still need to try out differential bushing setups. So far all mediums have been amazing, but have read about people loving 2 soft 2 medium working out great. These bindings are everything I wanted in last years IPO's. better straps and high backs. the problem for most people will always be fitting into the right size binding. every boot is different, I've seen a 10.5 fit into my drive mediums perfectly and a set of 32 10.5's perfectly fit into a large. If the boot doesn't work with the binding then you won't feel the difference. NOW is the time to try some NOW bindings! My NOW Drive bindings are light, responsive, extremely adjustable, comfy as hell, and very well made. From the moment I attached the Drive's to my board I new these bindings were gonna be Rad. The small but very thoughtful idea of having a "locked" washer in the binding really helped as I have had bindings loosen on the hill which is a huge pain. The binding straps are also easily adjustable on the fly. I re-adjusted and tightened my strap up mid chair ride in -25 degree weather with no problems. The Kingpin system works well and just adds a certain FLOW to my riding that I really enjoy. It makes snowboarding even more fun than it was before....which, I thought, was tough to do! Avid Snowboarder for over 20 years. Im one of the guys this binding did nothing for. I was riding Targas on my T.rice 161.5. Rome Inferno boots. This binding did absolutely none of what it was "designed" to do except soak up some chop when flat basing slightly better but at the same time the cushion in my opinion was lacking so it all avg'ed out. I felt the delay in turning, the heel cup is tiny and you may strap in thinking your boot is seated then half way down you notice the straps are way loose. The highback is almost noodlish. For this to be marketed as a big/all mountain killer is comical. Its way more of a overpriced soft park binding that flexes like hell. I agree with the spring idea too.This binding is ALL plastic except for the disc. All in all i just put my targas back on and im ready to ride again.